To know what kinds of tools you need depends on the jobs you plan to do. 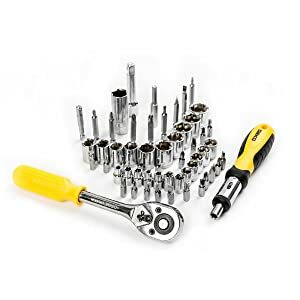 Hand tools are perfectly good for small jobs and for larger jobs and functions in the construction trades, you will want power tools in your home repair tool set. 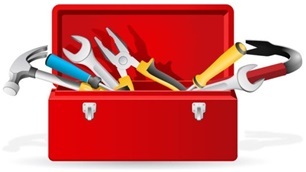 The top 10 best tool sets or kits are discussed below to help you decide what to buy. You can always add on the high-quality brands of power tools such as saws, compressors, sanders, paint sprayers, and more, since those items can be very expensive. Here hand tools and drills are evaluated to stay within your budget. Avoid buying cheap tools that is like burning your money with nothing to show for. Today the lithium-ion batteries are popular and energy efficient. They are much better that the NiCad batteries and are a standard on the products shown here that are rechargeable. Lithium-ion batteries last longer, run longer, and can charge overnight while you sleep being ready for you the next morning. Most cordless drills are lightweight at only about 3-pounds. I don’t know about you, but when I’m in a hardware store I want all of the gadgets that I see. I have to smack my hands to not put something in my shopping cart. I have kits useful for everything, but then I see a new item that I’m sure I’ll use and never do. Read the guide below for home tool set reviews to get you started on your fix-it adventures. For those of you who don’t know what SAE means, it is the Society of Automotive Engineers denoting tools measured in fractions of inches. It is also known as standard tools, or imperial measurements depending on where you come from. The British system used in the USA are inches, feet, and yards. Metric is very accurate and is being used more in the USA now. Metric measurements are in meters (m), centimeters (cm), millimeters (mm), and more. For example, some tires are measured metrically to include the bolts to hold the tires on and you are usually given a metric wrench head for removing tires to rotate when you buy the tires. Tools designed using the British system cannot be used with the metric system. Some manufacturers now provide separate sets of tools in the same packaging with both methods, yet many producers do not. For your home repair tool set, you will want these standards. Discover the home tool set reviews below. Crescent®, originally called the Crescent Tool Company, is a brand of hand tools started in 1907 in Jamestown, New York. Apex Tool Group™, LLC now owns the company™ in Sparks, Maryland as part of its Hand Tools division. Crescent® is a true American icon and flagship tool! It is a best tool set for its style of adjustable wrench. The model number CTK170CMP2 is a best seller on Amazon.com® for all the things you can do well. The case closes securely to take the general tool set with you. The case is gray, and the tools are made of steel with a chrome finish. Crescent® is respected by tradesmen and homeowners alike for its utility and durability. Today, Crescent® offers many other high-quality tools, including tongue and grove pliers, locking pliers, screwdrivers, and nutdrivers, not included in this set. 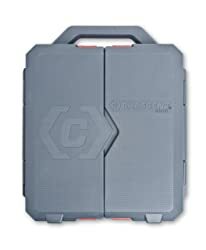 The sturdier blow-molded case is durable and holds an assortment of hand tools used in most home, industrial, and mechanical purposes. The entire set has been updated to have the newest and better-quality Crescent® screwdrivers, my favorite forever! This set provides tang sizes of 1/4-inch, 3/8-inch and 1/2-inch drive tools both SAE and metric. The drive type is 6- and 12-point. 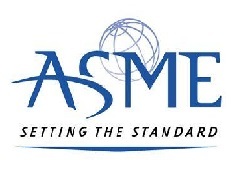 The tools conform to the strict ANSI and ASME specifications with a full satisfaction guarantee. There is no torque wrench in this set. 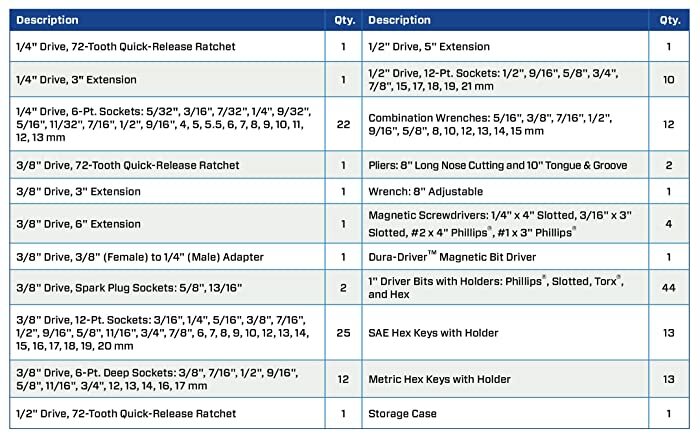 Torx bits: T8 yes; T60 no. The dimensions when the case is closed are 16.20-inches long x 19.100-inches wide x 3.60-inches high. Be careful with your case; the manufacturer does not sell cases separately. The weight of the tools in the case is 22-pounds. There are no holes for a padlock, but a chain will go through the handles to lock. Gift-wrapping is available for your tool loving family or friends. You will receive instructions. Crescent® hand tools are warranted for life to be free of defects in material and workmanship. Carrying cases, pouches, accessory bits, and consumable products, if any, are not covered by this Warranty. The set is made in China and Taiwan. 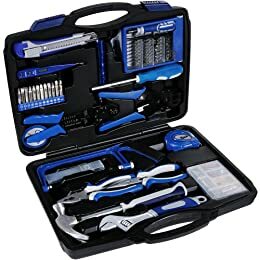 Crescent® CTK170CMP2 Mechanics Tool Set, 170-piece review. The STANLEY® company has been around for years. Stanley® Black & Decker™ provides the tools and innovative solutions you can trust to get the job done—and they have since 1843. A bit of history if you’re interested. In 1843, Frederick Stanley started a small shop in New Britain, Connecticut, to manufacture bolts, hinges, and other hardware of high quality from wrought iron. In 1910, Duncan Black and Alonzo Decker started their shop in Baltimore, Maryland, and six years later obtained the world’s first patent for a portable power tool. Over the years the two companies amassed an unparalleled family of iconic brands and trusted products. 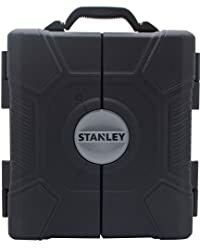 In 2010, they came together as Stanley® Black & Decker™, a leading global diversified industrial known for superior quality and continual innovation providing the best home tool kits. The item number STMT73795 on Amazon.com® is a best seller with great customer satisfaction. The body of the tools are chrome vanadium forged for torque, strength, and great durability to last years. So that the tools will not corrode, they are given a fully polished chrome finish. The Stanley® tools meet or exceed ANSI specifications. The set is also available in 170-pieces. The tools fit snugly into their own holder place in the blow-molded carrying case to take with you and to store as well. On the job, this is the perfect tool set for a mechanic, good for using at home to tighten things and do your own projects. This is a necessity for the ladies too! Girls can do anything! These rats have 52 teeth with a minimum arc of 7-degrees. Another thing you might want to know is that the 1/4-inch sockets do not have grooves in them, so they do not firmly lock onto the ratchet head. They won’t fall off, and you will be able to pull them off. The 3/8-inch and 1/2-inch sockets have grooves, so they lock firmly into the rats. You won’t be able to pull them out until you press the quick-release button. The dimensions when the case is closed are 16-inches long x 15-inches wide x 4.50-inches high and weighs about 20-pounds. Gift-wrapping is available, you get instructions and a Limited Lifetime Warranty. Made in China. STANLEY® Mixed Tool Sets video. 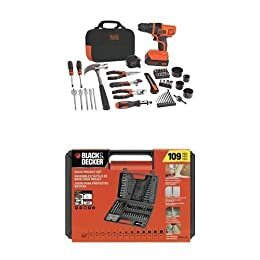 The Black & Decker™ LDX120PK set has 68 pieces plus the accessory set, BDA91109 comes with the lithium-ion drill and other tools. You can also select just the drill/project set, accessory set, project kit with circular saw, project kit with jigsaw, project kit with reciprocating saw or project kit with sander. 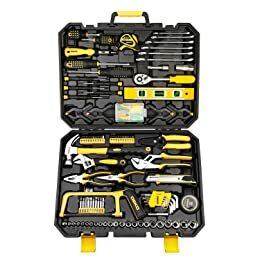 As always, this company makes tools that are durable and long lasting on Amazon.com®. 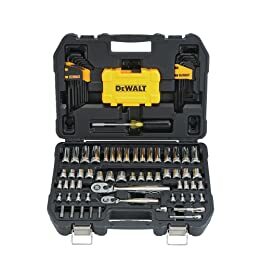 For home projects or at your job, this is a best tool set with its lithium-ion drill that is 20-Volt max and holds its charge up to 18-months. You will like the 11-position clutch so that you don’t strip or overdrive screws; it drills too. The charger comes with the kit. If you need to replace the battery, go to Amazon here. 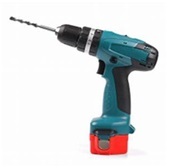 However, for the price of a battery you can buy a new drill; so, keep your first drill as a spare. The battery shows: 20-Volt max type at 1.30-W/h. The battery charger input is 110/120-Volt, 50/60 Hz, 300 mA. The charger plugs into a USA and Canada 110/120-Volt receptacle. 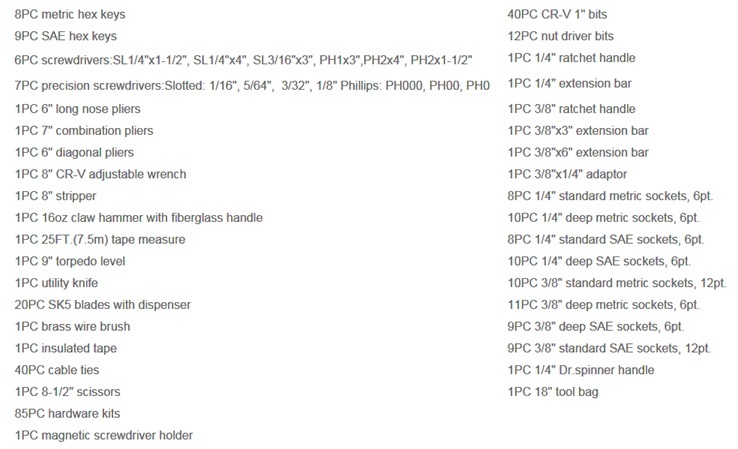 You get 68 hand tools, accessories, and the carrying case for storage and transportation. The 3/8-inch chuck is made of metal not plastic for firm tightening. There is a LED light at the back of the barrel to help you see when drilling into low-light areas. The drill head is magnetized to hold the screw head in. You can always magnetize anything yourself by putting magnets in a box for the things you want magnetized such as screw drivers, pliers, and more. Use the button to change it to turn clockwise or counterclockwise. This drill has torque settings variable from 1 up to 10. The RPM is 650 and the drill weighs about 3.25-pounds. This is not heavy enough to be used as an impact wrench to change tires! Get yourself and impact wrench to remove wheel bolts and a torque wrench to tighten according to manufacturer’s torque number in your User’s Manual. Of the 32 bits in the set, 6 are Torx: Two each of T10, T15, T20. The entire packaged kit weighs about 5-pounds and is light enough to carry around. No level is included with this kit. That’s a separate relatively expensive device. No plumb bob is provided either. You will receive a User’s Manual and a registration card. You will get a 2-year Limited Warranty. Black & Decker™ (U.S.) Inc. warranties this product to be free from defects in material or workmanship for a period of two (2) years following the date of purchase, provided that the product is used in a home environment. This Limited Warranty does not cover failures due to abuse, accidental damage or when repairs have been made or attempted by anyone other than Black & Decker™ and its Authorized Service Centers. It is made in China. Black & Decker™ Tool Kit LDX120PK unboxing review video. DEKOPRO DEKO® is in Ningbo City, in the east of Zhejiang, one of China’s oldest cities. 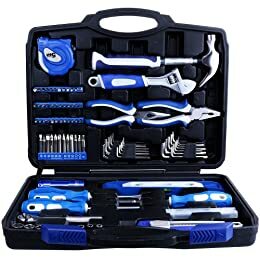 The part number XUGEL GROUP, ASIN B0723914V1 on Amazon.com® has socket wrench auto repair tools with a mixed set of hand tools and a hard storage case with handle. The tools are yellow and black forged of steel with a chrome finish for durability and strength. The handles are ABS (acrylonitrile butadiene styrene) plastic. Smaller sets are available in 40- and 128-pieces for your best home tool kit. The DEKO® tools meet or exceeds ANSI standards. The set is ideal for home users, people doing repairs, construction, mechanics and are great to have in your workshop or garage. 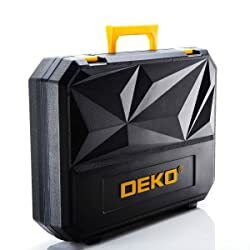 The DEKO® case is a diamond pattern blow-molded and is 18.50-inches wide x 14.17-inches long x 4.72-inches deep and weighs 13.49-pounds. A drill is not included in this set. This set is loaded with many useful tools, however. Gift-wrapping is available for your tool loving family and friends. You will receive instructions and the kits are made in China. DEKOPRO 168 Piece Home Tool Kit review video. 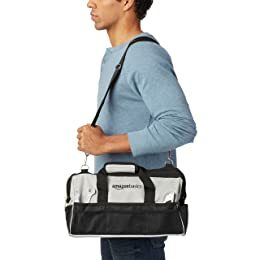 The AmazonBasics® kit is sold by and shipped by Amazon.com®. The part number GS201606-115 is an Amazon brand to be trusted. A soft carrying case with handles and shoulder strap is included with the set and is a nice change from a hard case made of nylon. The bag’s dimensions are 15-3/4-inches wide by 7-3/4-inches deep by 9-3/4-inches tall and weighs about 11-pounds. The bag is one compartment inside with pouches too. 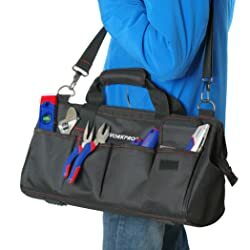 The pouches outside let you carry your cell phone, small tablet, keys, and other personal items along with more smaller tools you like to have in your tool kit. The kit also comes in a 65-piece set if you need fewer tools. You will receive a diverse set to include a level, Allen wrenches (hex keys), utility knife, 16-ounce x 13-inch long claw hammer, and more. All of the tools are made with soft-grip plastic handles and the metal is CRV (chromium-vanadium) steel alloy that resists corrosion. The 16-foot measuring tape will fit a side or interior pocket that reads in SAE and metric. The Torpedo level is 9-inches long, magnetic, with I-beam aluminum frame and strong magnets. You will receive 3 wrench sets, 4 pliers with needle nose, screwdrivers with bits, aluminum hacksaw of high-speed steel (HSS) blade, drill sets in a metal case and nut drivers. For an enumerated list, see on Amazon’s description page. 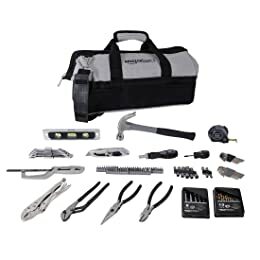 For the inexpensive price and excellent quality, this is a good set for home repairs and putting into the car’s trunk or truck even a horse trailer to have for emergencies. Gift-wrapping is available, instructions are included, and Amazon’s Warranty applies. It is made in China. AmazonBasics® Tool Kit unboxing video. The DEWALT tools are another best brand for longer lasting life and the 1/4- and 3/8-inch will prove to be a winner for your tool box. The model DWMT73801 is a best seller on Amazon.com®. 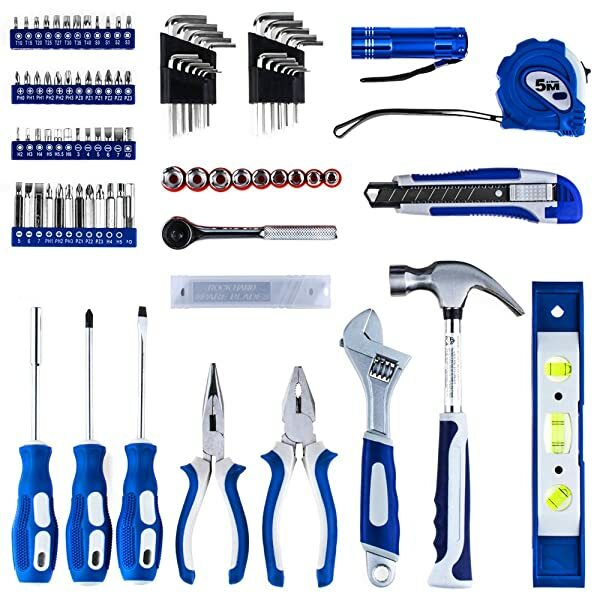 With this set, you will have the tools you need for the job. You will receive the mixed set to include 2 each Pear Head ratchets with an assortment of adapters, extensions, and sockets. The sockets use the DEWALT® DirectTorque™ technology to help prevent rounding of fasteners and to provide better grip. You will receive the hard case with spacing to hold each shape tool snugly, a quick release 72-tooth ratchet for high torque, vinyl grip bit driver that won’t slip, a knurled control ring, and all tools are made of steel with a polished chrome vanadium finish. Vinyl Grip Multi Driver, 22-pieceBit Set With Storage Case. The case dimensions are 15.8-inches wide x 11.6-inches front-to-back x 3.5-inches deep and weighs about 4.9-pounds. This is a great starter set to use on vehicles, motorcycles, and use around the house. The nut sockets work with electric screwdrivers and 1/4-inch impact drivers for hex shank bits. Gift-wrapping is available for all your family and friends who would love this set as a gift. You will receive a Lifetime Warranty, instructions, and it’s made in China. DEWALT® 108 Piece Mechanics Tool Set video. 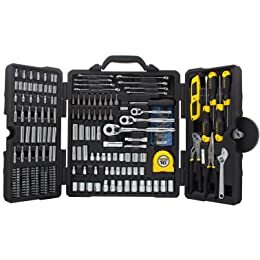 Vastar, owned by Alizon Tech Corporation, item model number VRK21-ALX-1 on Amazon.com® is a good selling tool set for home repairs and maintenance that comes in a hard-plastic storage case. The tools are made of vanadium steel with chrome finish. The ergonomic hands give a sure grip when holding. For the inexpensive price, this set can’t be beat. Gift-wrapping is available for all your family and friends who would love this set as a gift. You will receive an 18-month Warranty, instructions, and it’s made in China. Vastar 102 Piece Home Repair Tool Kit video with catchy country tune. 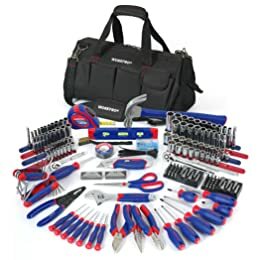 The WORKPRO®, model W009037A on Amazon.com® is indeed a lot of tools for beginners and seasoned users as well for general use at home and on the job. It packs up into its own strong and durable 18-inch nylon bag for easy carrying and storage. The tools are tough made of vanadium steel with chrome finish and has been heat treated for more strength. 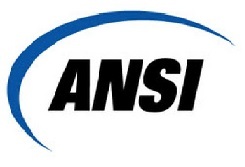 All tools meet ANSI standards. 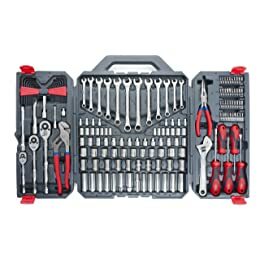 This brand also comes in a 123-piece set at the same price as the 322 pieces but with different tools. Check it out on Amazon. This set will not disappoint you. This carrying bag has handles for carrying or pull over your shoulder with the long strap. With the outside pockets, you can have your cell phone and car keys nearby plus smaller tools. It zips closed so not to lose anything inside. The 8-inch adjustable wrench, called a monkey wrench by me, shown below, has a sure grip comfortable handle. Gift-wrapping is available for all your family’s women and men and friends who would love this set as a gift. You will receive a Limited Lifetime Warranty, instructions, and it’s made in China. The Rovtop professional general household tool kit for home maintenance with plastic toolbox storage case is an essential kit to have around. 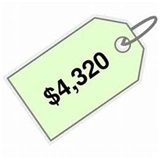 The part number RTK2-JKRPUS01 on Amazon.com® is inexpensive and a best seller. It functions well for automotive working and is good for putting pictures on the wall and other household do-it-yourself fixes, repairs, and new builds. It’s superb for greenhorns and experts alike both women and men. Fix electrical, appliances, furniture, cabinets, doors, windows, and more. The storage case is black plastic with carrying handles that shut tightly. 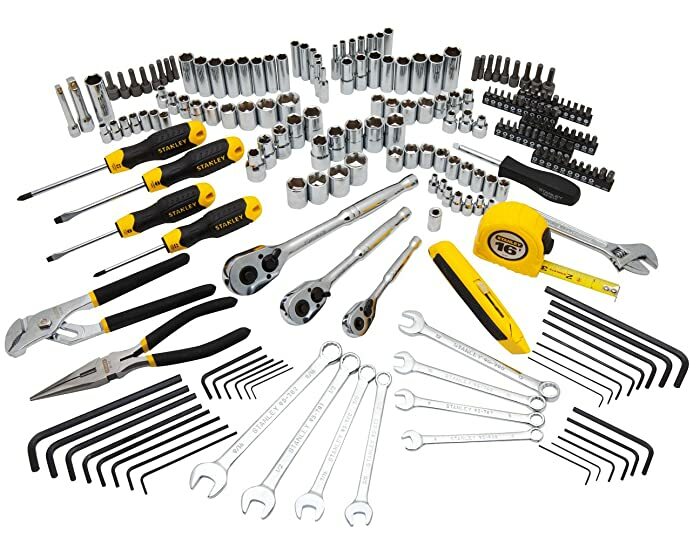 All the tools you can possibly need for small repairs are at end neatly organized. The storage case is handy for small parts. The tools are all metal with great ratchet handles with thumb operated reverse switch mechanisms. Gift-wrapping is available for all your family’s women and men and friends who would love this set as a gift. You will receive a 24-month Warranty, instructions, and it’s made in China. 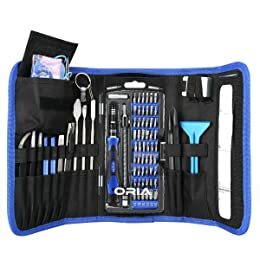 The ORIA 86-in-1 multi-magnetic screwdriver tool kit is useful for electronics such as iPhones, 8 Plus, game consoles, tablets, computers, laptops, MacBookPro, iPads, cameras, calculators, and more electronics. You can even tighten your eye glass frames and repair watches. The item model number OUS-HA21-O52118 on Amazon.com® is a top best-selling product. The tools can also be used around the house and other places when needed for that application. You will receive a nylon bag for taking the tools with you and where you are working at home or business. The packet closes with heavy-duty Velcro®. The tools will connect to a 6.35 electric screwdriver with the connector included making these tools quite versatile. All you need now is a bottle of denatured alcohol for cleaning the tiny electronic parts with a cotton tip swab. 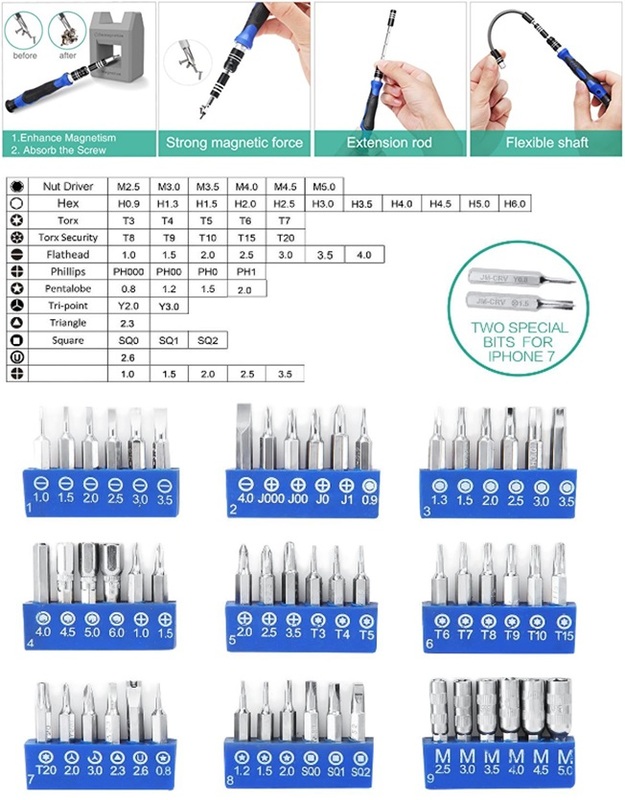 The screwdriver bits are made of CRV (chromium-vanadium) steel where the hardness can reach to HRC52-56 (S2 steel) for long life and durability. The driver will not slip and is machined from 1 piece of aluminum then covered with silica gel with a ball bearing mounted for the top to swivel. The screwdriver is non-ratcheting. The set comes with special bits for iPhone 7/7 Plus. New bits are included in Y-size 0.8-inch with 2.5-inch mainboard size. You can hold the tools longer because the driver will not skid and is anti-static. It has tips for a PlayStation 4 system and will open an iPhone 6 with pentalobe screws. It even has the special tip to take apart Wii controllers. The tips are not magnetic; put in a box with magnets to magnetize them forever. The dimensions of the case are 2.8-thick x 5.3-inches front-to-back x 9.1-inches wide and the set weighs about 2-pounds to put in your backpack or satchel. 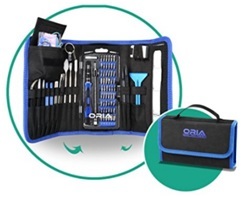 ORIA 86-in-1 Tech Tool Kit – Great for Technology Projects review video. 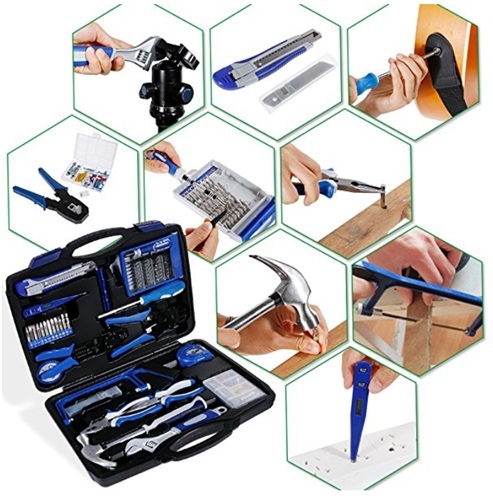 We hope the home tool kit reviews above have given you the best choices when buying tools for business and electronic use as well. Come back and visit our site often for great products, buying guides, and tips. Happy shopping!